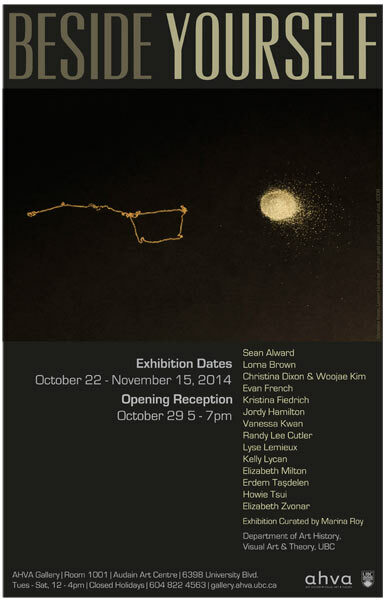 Exhibition runs October 22 to November 15, 2014. Opening Event – October 29th, 5pm. To be beside yourself. To think of others, besides yourself. To feel outside yourself. We are in interaction with an affective field, the body a surface of intensities, the brain translating these, at times, as emotions or feelings. Artworks have the capacity to move us, and artworks contain much that resists interpretation. The ’emotional turn’ in art might stem from the realization that the experience of the body means something, especially in its connection to the surrounding world – how relations between things, object, beings, and events, assemblages of materials and entities external to ourselves, have potential for sparking new affective relations. Feeling the body destabilized and decentered can bring one closer to demystifying the ‘primacy of the subject,’ a position upon which oppressive, alienating structures continue to capitalize. We have come to realize that to be affected and to have the capacity to affect figures largely around questions of agency, and trying to come to terms with what lies beyond our knowledge can be of the utmost urgency. Beside yourself reflects on the potential of artworks as they exist in affective relation to us. Exhibition curated by Marina Roy. AHVA Gallery hours: Tuesday to Saturday, 12 – 4 pm. Closed Holidays. AHVA Gallery – room 1001, Audain Art Centre, 6398 University Blvd. This entry was posted in 2014-15, Exhibition Images, Exhibition Posters, View all Past Events and Exhibitions. Bookmark the permalink.